The 2008 Uniqa EHF Men’s Champions Trophy takes place in a state-of-the-art sports hall in Veszprém. The operator talks to Eurohandball.com about Veszprém Aréna. The 2008 Uniqa EHF Men’s Champions Trophy has been a remarkable tournament for a number of reasons. The four top clubs met an enthusiastic local fan club in a brand new sports hall. 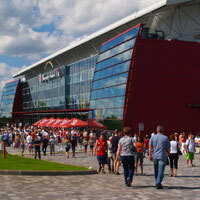 The Veszprém Aréna was inaugurated in July 2008 and this is the first major international event organised in the hall. Earlier coaches, such as Kiel’s Alfred Gislason and Veszprém’s Lajos Mocsai talked to Eurohandball.com and emphasised how much they were looking forward to playing there and trying it for the first time. After the first game, Nordhorn’s Ola Lindgren and Ciudad Real’s Talant Dujshebaev also praised the hall and the unique atmosphere experienced there. Eurohandball.com talks to Rita Szauder, director Veszprém Arena’s operator company. Rita Szauder: Building a new sports hall was always the desire of the people in Veszprém. It was a priority as the city is home to MKB Veszprém, an elite handball club. The construction works took 11 months and the opening event took place in July this year. Rita Szauder: The atmosphere has been tested already at the opening ceremony that took place in front of a full house. So far 35 000 guests enjoyed events in the new hall and their reaction was very positive. They like it and take care of it. Eurohandball.com: Who will be the beneficiary of this new sports hall? Rita Szauder: This is a handball hall, first of all, you can see this immediately just by taking a look at it. The plans were based on the handball hall of Celje, another hall built for handball purposes. The Slovenians were so kind to provide us with the plans free of charge, we made some changes and built the newest and most modern sports hall in Hungary. However, Veszprém Aréna can also serve as an events’ hall with high quality light and sound technology. Our wish was that this sports hall can serve the handball fans, the visitors coming to Balaton in the summer period and also the region of Veszprém on the long run.